This is a wonderful place for a fantastic holiday stay. You'll find this comfortable holiday home on the outskirts of lovely Esclanyà, nestled between picturesque villages like Palafrugell (3 km) and Begur (4 km), to which the town belongs. These villages practically beg to be discovered and rediscovered anew. After a wonderful day out, you'll return to a magnificent home. 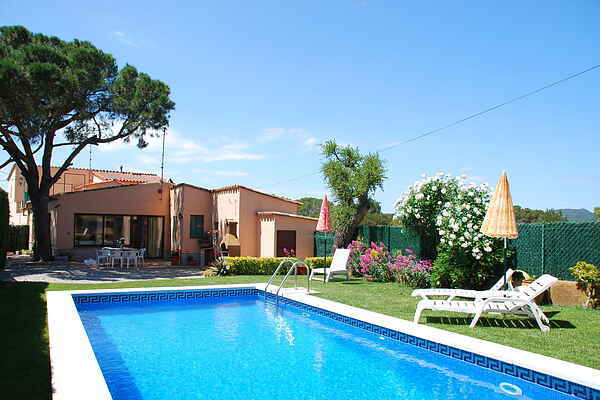 You can lay down by the cool swimming pool, or in the shade of an old pine tree on the terrace right beside the house. There is also a fenced-off and child-friendly garden, full of great spots to sit and relax. There's a stone barbecue, just waiting for you to use it. One thing is for certain: meat or fish cooked up on a barbecue just tastes so much better! Would you rather enjoy the convenience of eating out? Only 4 km away you'll find a wide variety of restaurants. This is also where you'll find the supermarket. You won't be bored in this area. In the immediate vicinity you'll find places between 5 km and 10 km away, which are well worth the minimal effort to visit. Like the beautiful bays of Begur, Llafranch, Callela de Palafrugell, and Tamariu. At least, make sure you find your way to the stunning seaside trail from Llafranch to Playa de Pals.